MADDOG wrote: Gallo wines on Underhill Blvd became Premier wine merchants, then they sold the building to Southern wine and spirits (now Southern Glazer wine & spirits-SGWS). Before it was Premier, it was Star/Major/Selected wines and Spirits who still maintain an office there. I understand that SGWS extended the sidings. Star Industries (an independent liquor bottler and distributor), produces and bottles Georgi vodka. The vodka is locally blended and bottled here. BuddR32 wrote: What part, if any does/did the single track trestle over the Meadowbrook play into this? If that is in fact a railroad trestle. Well, if you're referring to the brown-painted girder bridge that crosses a little SE of Zeckendorf Blvd, near the Lowes Home Center, that used to be the way to access White Rose and a handful of other industries north of the Meadowbrook back in the day, as well as (occasional) passenger service to Roosevelt Raceway. What it is doing now is mostly growing shrubs in the ballast. What it will be in the future...well, it was suppose to be part of the Nassau Hub proposal. Other than that, I have no idea - does the MTA? Don't forget the hidden buried trestle near the Meadowbrook off ramp, once part of the Central Branch. I was talking about the one that crosses the parkway. I had no idea the other one existed! I will look for it when the trees shed their leaves, I bet its a cool sight! Thank you. 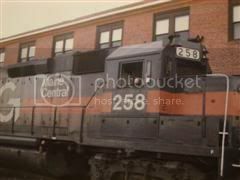 Teutobergerwald wrote: Anybody have pics of the Alco C420's, 222-229, in the yard or on the line????? They were a catch anywhere they were seen outside of Queens prior to 1989. Also, anybody remember when the 224 derailed at the Zeckendorf Blvd. crossing in the mid-'80s? There was a picture and blurb in Newsday, the day after. 224 was headed short-hood first in the picture. Can't find the pic or reference to the incident anywhere. A search of Newsday's archives yields a reference to a photo of a derailment that fits this description, published on 3/19/86. Unfortunately, the photo is behind a pay wall. Damn that pay wall !!!!!!! The tracks on the trestle over the Meadowbrook have been removed in the last year or two. If anyone has a link, I may be able to view it the picture and copy it. The 222 looks great in that picture, as well as the other Alco L-2. Anybody know which was the other L-2 on this excursion???? Can't make it out looking at the picture. Also, which power-pack provided the HEP for the trip on the west end of the consist ??? If i remember right the blow to freight was made as a sacrifice to the God of NIMBYism, Cures, may his name be forever unremembered. Teutobergerwald wrote: The 222 looks great in that picture, as well as the other Alco L-2. Anybody know which was the other L-2 on this excursion???? Can't make it out looking at the picture. Also, which power-pack provided the HEP for the trip on the west end of the consist ??? Great photos. Thanks for sharing, Bill. Bad Luck wrote: Great photos. Thanks for sharing, Bill. Guess I'm getting nostalgic about the days when a fan trip was an all day thing we all looked forward to. Shot rolls of film, seen guys we haven't seen in years. Had the trains posed the way we wanted to for the photographers. It's what made rail fanning special. But high insurance rates and the post 9/11 world we live in seems to have made that a thing of the past. All we have is our sweet memories !